Linear Operators and Their Essential Pseudospectra provides a comprehensive study of spectral theory of linear operators defined on Banach spaces. The central items of interest in the volume include various essential spectra, but the author also considers some of the generalizations that have been studied. In recent years, spectral theory has witnessed an explosive development. This volume presents a survey of results concerning various types of essential spectra and pseudospectra in a unified, axiomatic way and also discusses several topics that are new but which relate to the concepts and methods emanating from the book. The main topics include essential spectra, essential pseudospectra, structured essential pseudospectra, and their relative sets. This volume will be very useful for several researchers since it represents not only a collection of previously heterogeneous material but also includes discussions of innovation through several extensions. 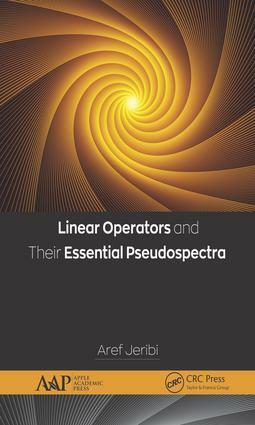 As the spectral theory of operators is an important part of functional analysis and has numerous applications in many areas of mathematics, the author suggests that some modest prerequisites from functional analysis and operator theory should be in place to be accessible to newcomers and graduate students of mathematics. Aref Jeribi, PhD, is Professor in the Department of Mathematics at the University of Sfax, Tunisia. He is the author of the book Spectral Theory and Applications of Linear Operators and Block Operator Matrices (2015) and co-author of the book Nonlinear Functional Analysis in Banach Spaces and Banach Algebras: Fixed Point Theory under Weak Topology for Nonlinear Operators and Block Operator Matrices with Applications (CRC Press, 2015). He has published many journal articles in international journals. His areas of interest include spectral theory, matrice operators, transport theory, Gribov operator, Bargman space, fixed point theory, Riesz basis, and linear relations.